TDs were informed about what new portfolios they would taking on this morning. IN A SURPRISE move, Fianna Fáil leader Micheál Martin has today announced a reshuffle of his front-bench. Pressure has been mounting on Martin in recent months to spruce-up his front-bench, amid point drops for his party in recent polls. Today, Martin appointed Dara Calleary as deputy leader and Director of Policy Development. 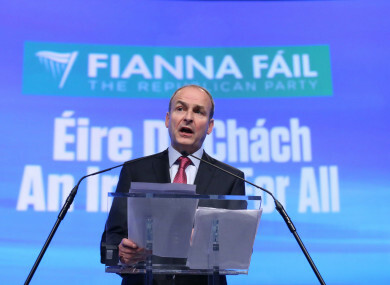 “Fianna Fáil’s core aim in this Dáil is to make full use of the democratic mandate we have, to hold the government to account and ensure that fairness is at the centre of the decision-making process,” said Martin. “Through the Confidence and Supply Agreement we have secured a focus on investment in public services and we continue to drive forward the argument for action on the country’s housing and health crises. “We will also continue to develop new policies and strategies to deal with the country’s problems, refreshing and renewing our plan to ensure an Ireland for all,” concluded Martin. Email “Micheál Martin announces Fianna Fáil front-bench reshuffle: Here's who got what job”. Feedback on “Micheál Martin announces Fianna Fáil front-bench reshuffle: Here's who got what job”.